A health-warning label on sugary beverages in California is the first step in addressing chronic-disease epidemics, public-health advocates said. Such a label would give the consumer a moment of pause, said Laura Schmidt, professor at the Institute for Health Policy Studies at the University of California-San Francisco School of Medicine. “The main thing that the warning labels can do is they can make the consumer think twice before reaching for the product,” she explained. CrossFit Inc. Founder and CEO Greg Glassman is a label supporter. 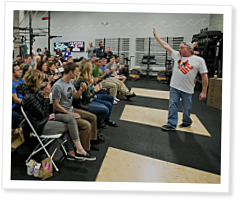 He recently visited nine California affiliates as part of CrossFit’s “California Invasion: Rally to Fight Big Soda.” At each of the nine stops in Southern and Northern California, he asked members of the community to contact their state senators via CrushBigSoda.com to voice their support for such a label in The Golden State. Once a label is in place in California, it will spread to the East Coast and then abroad, Glassman said. Bill dies in committee but supporters say anti-soda legislation is just a matter of time.